Carla Provost, deputy assistant commissioner of the U.S. Customs and Border Protection Office of Professional Responsibility (OPR) since September 2015, has been appointed to the role of deputy chief at the agency. Provost will serve as the Border Patrol’s deputy chief and have responsibility over the agency’s daily operations, planning and nationwide enforcement initiatives, the Customs and Border Protection agency said Wednesday. 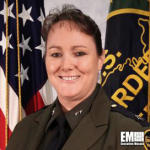 “Carla Provost is a proven leader who has demonstrated the courage to take on tough assignments, find solutions to the greatest challenges and direct federal law enforcement organizations toward mission success,” Border Patrol Chief Mark Morgan said. Provost joined the Border Patrol in January 1995 and took her first assignment as a Border Patrol agent to the Douglas Station in the Tucson, Ariz. sector. She was promoted to supervisory Border Patrol agent in 1997 and later to field operations supervisor in 2001 and other higher level roles until January 2013, when she became chief patrol agent of the El Centro Sector. Provost stood up CBP’s Use of Force Center of Excellence, now known as the Law Enforcement Safety and Compliance Directorate, to develop CBP’s use of force policy and establish operational Use of Force programs. She was a police officer with the Riley County Police Department in Manhattan, Kansas prior to CBP.